Monty Python’s The Meaning of Life is far more sketch-orientated than their other films, but that allows for infamous scenes like this. 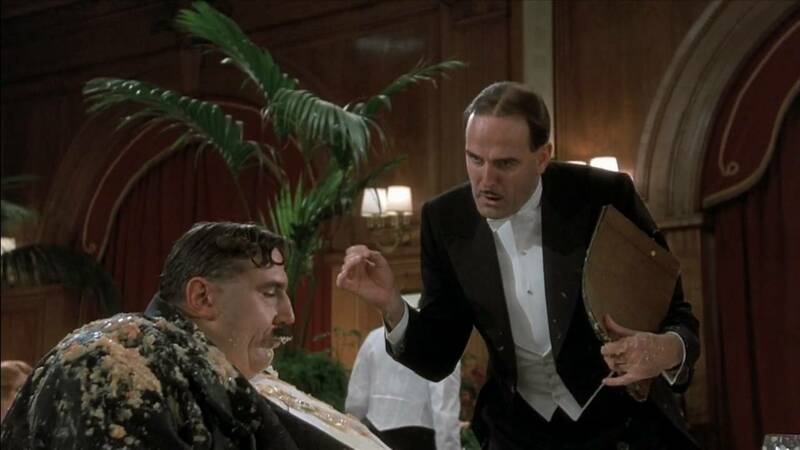 Mr. Creosote is truly a glutton, stuffing himself with fine food until he is sick. And then stuffing his face some more. We’ve all been there, of course. You’re in a restaurant, you loosen your belt a little, but can’t bear to see food go to waste. After all that food, what’s one wafer thin mint? Particularly, in the case of Mr Creosote, when you’ve already filled a bucket with the overflow of the meal. He tries to refuse, however, but the waiter is determined, clearly realising what the resulting effect will be. Mr Creosote relents, of course, and meets an explosive end.